It could be the most hated bird on the Oregon coast, at least by the locals. Why? Not for any good reason but because it is endangered and wildlife officials would like to close some small areas of a few beaches to save it. Many locals would rather see it go extinct ...and that is sad. As is usual for me, this painting was created using just three near-primary colors. It's all in the mix... This painting has won an award. I now have it in my private collection, matted and framed (16x20). Feel free to make an offer if you are interested. 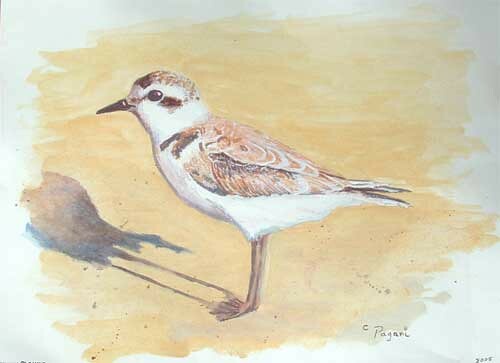 I'm reading: Snowy Plover, Oregon Shorebird. (Acrylic Painting)Tweet this!